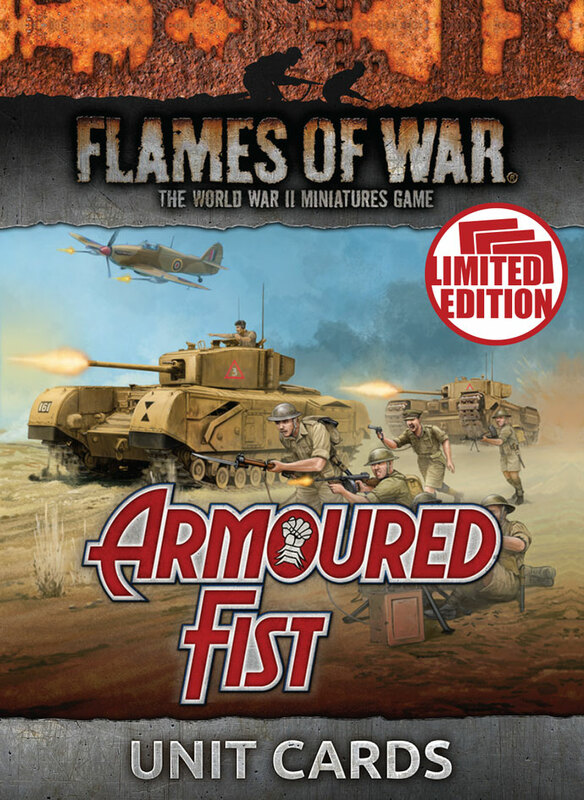 Armoured Fist is the next step for the British Army in Flames Of War. 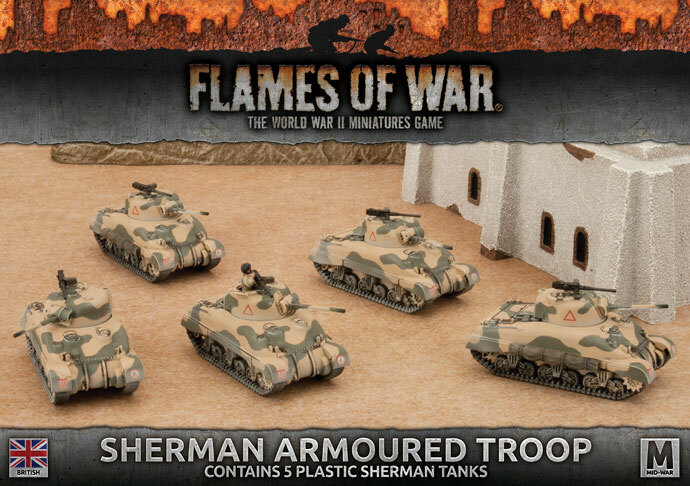 It takes the forces from Desert Rats and expands them to include the Valentine and Churchill infantry tanks and the Sherman heavy tank, as well as a powerful rifle company and a few new support options. 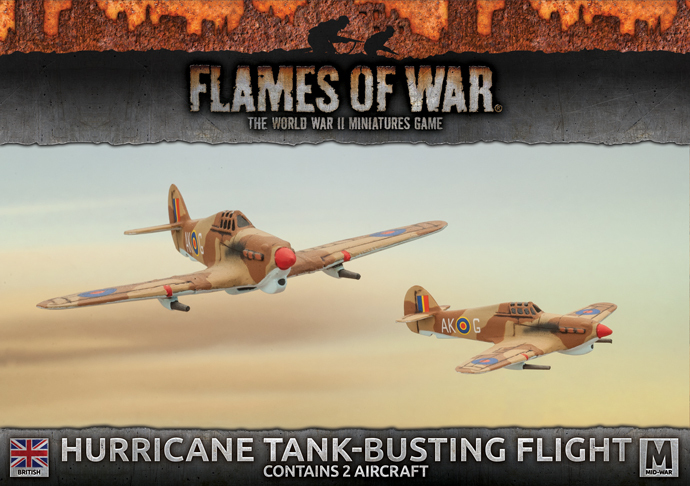 The 6th of April marked the launch of Battlefronts latest release Armoured Fist. Ee celebrated with a day of activities and articles from the New Zealand office. Check out all the content in the link below. The Churchill tank first went into action as part of the raid on Dieppe on the French coast in August 1942. Their performance there was less than spectacular. Two months later, the Churchill was given an opportunity to redeem itself in the form of Kingforce. By the end of the Battle of El Alamein, the Kingforce had destroyed five panzers and three anti-tank guns for the loss of one tank. The Churchill tank had shown that it was ready for battle. It was capable of taking punishment and handing it out in spades. The eyes of the world are on the complex and bloody campaign unfolding in the Western Desert of Egypt and Libya. If the Axis can succeed in pushing the British out of Egypt, there will be nothing keeping them from the rich oil fields of the Middle East, and the strategically vital Suez Canal will open the back door to the Far East. The brave but battered soldiers of the Eighth Army hold the last line of defence against fascist conquest. Designed for a refight of the First World War. The Churchill III that made up the bulk of the Churchills in Tunisia were armed with a 6 pdr (57mm) gun in the turret and a hull machine-gun. 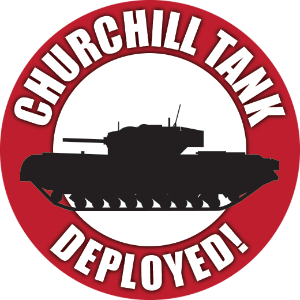 Only a few of the original Churchill I tanks were retained as CS (Close Support) tanks in the company HQ for artillery support. The new Sherman tank was the next evolutionary step from the powerful Grant tank. Its large turret allowed it to mount an even more powerful 75mm gun in the turret rather than the hull front, and with thicker armour. The Valentine was designed as a cheaper alternative to the old Matilda infantry tank. Weighing in at just 17 tonnes, it was faster and almost as heavily armoured, though it retained the same light 2 pdr gun. Its biggest improvement was its mechanical reliability. 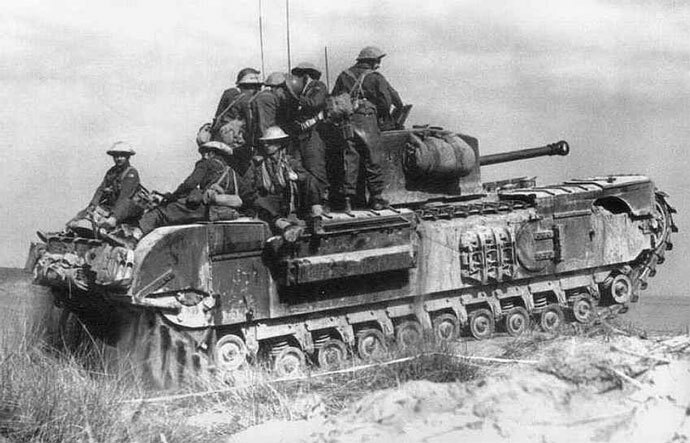 The Valentines of 23 Armoured Brigade crossed North Africa on their own tracks, fighting all the way. The American M7 self-propelled 105mm howitzer gained the nickname 'Priest' in British service from the pulpit-like machine-gun mounting. Built on the chassis of the Grant tank, the Priest gave the armoured divisions a mobile artillery piece able to keep up with its tanks during cross-country moves. British armoured regiments were delighted to receive the new American-made M3 Grant tank, which gave them a tank with a gun as good as those on the German panzers, with armour to match. Rushed into service to meet the urgent need for a heavy 75mm-armed tank it took the Germans by surprise. Its thick armour and powerful 75mm gun are superior to most of the German panzers. 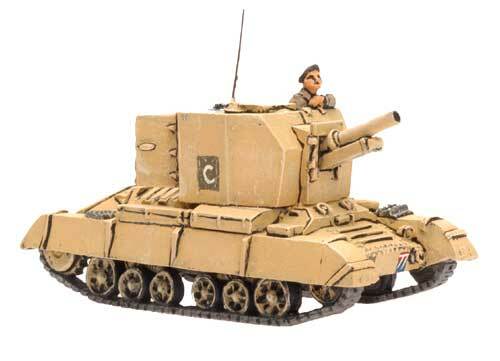 The M3 Stuart Light Tank is the first American-made tank supplied to the British Army under the lend-lease programme. One of its intended roles was infantry support. 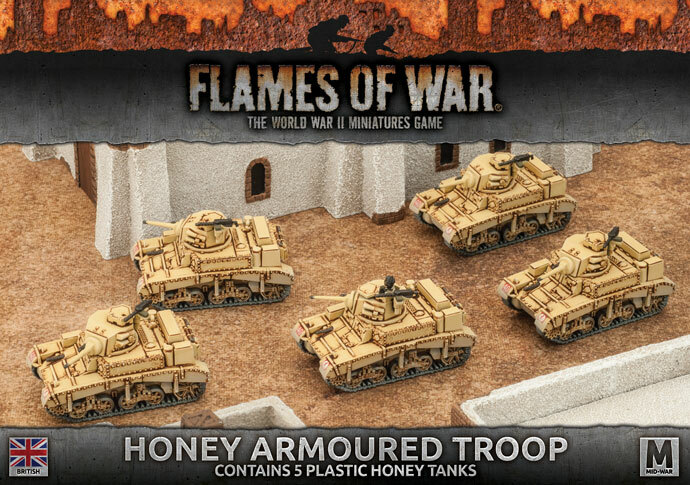 But to the British, infantry tanks are slow and heavily armoured, so the Honey is employed in the same way as the British-built cruisers. Compared with earlier British-designed tanks, it is much less prone to breaking down—so reliable that its drivers call it a ‘Honey’. The versatile Quick-Firing 25-pounder entered service just before the war began, and remains the main British field gun and howitzer throughout the desert war. Its main ammunition is an 11.5kg (25lb) 87.6mm high-explosive shell, with solid armour-piercing rounds also available. In the ongoing race between tank armour and anti-tank guns, even the 6 pdr would not be powerful enough for long. The answer was the huge 17-pounder. The barrel was ready by May 1942, but the carriage still needed work, so in an effort to rush the gun into service to deal with the arrival of heavy German panzers like the Tiger, a tempory hybrid solution was created by mounting the gun on a 25 pdr carriage. The resulting 17/25-pounder, codenamed the 'Pheasant', first saw action at the Battle of Medenine in March 1943. The Quick-Firing 6-pounder is a 57mm anti-tank gun which made its combat debut in the Gazala battles in May and June 1942. Dug-in and firing at only point blank range, these guns are deadly to enemy tanks. The rifle companies are the heart and soul of a rifle battalion. They are the ones who must clamber out of their fox holes, fix bayonets, and assault the enemy defences. They are the ones who must endure artillery bombardments, then be ready to repulse enemy attacks. Their long exposure to the rigours of desert warfare has toughened them, and taught them how to fight and win. Their tactics aren't subtle, they prefer to attack behind a heavy artillery barrage supported by infantry tanks. The 3-inch mortars of the battalion's mortar platoon give them immediate artillery support. 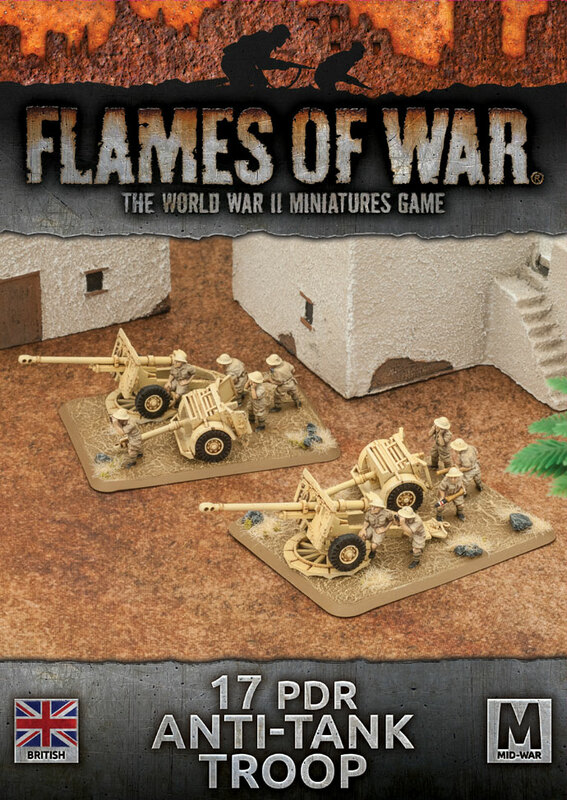 The mortars are excellent for softening up the enemy before an assault and for knocking out enemy machine-gun nests. The SBML (smooth-bore muzzleloading) 2-inch mortar conducts overhead fire, throwing a 1kg (2lb) high-explosive bomb in an arcing trajectory, down onto the heads of the enemy, making it excellent at knocking out dug-in enemy troops. 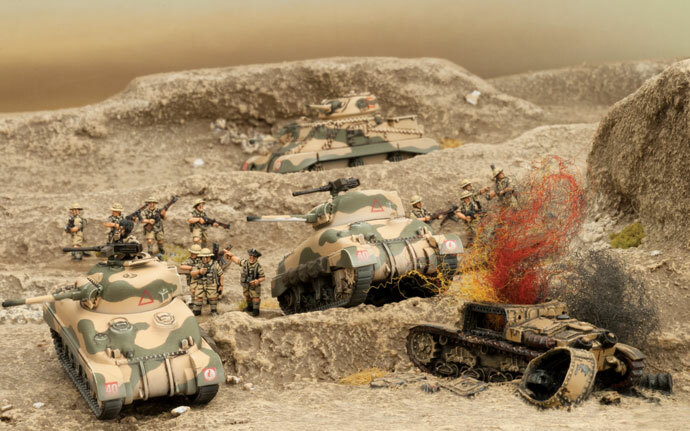 In the fast-moving environment of the desert war, it is the tanks that usually get all the glory. But the hard work still belongs to the PBI, the ‘Poor Bloody Infantry’. For such a small unit, a motor company has plenty of firepower at its disposal. Their machine-guns, anti-tank guns, and mortars can deal with almost any opposition. Machine-guns used to be grouped together in the battalion support company, but by 1942 each motor company has its own attached machine-gun platoon. Each motor company also has a section of two 3-inch mortars for close support. They fire a 5kg (10lb) high-explosive bomb which can knock out enemy gun positions or break up attacking infantry units. While not as deadly as its big-barrelled Royal Artillery counterparts, the 3-inch mortar is a more portable alternative. 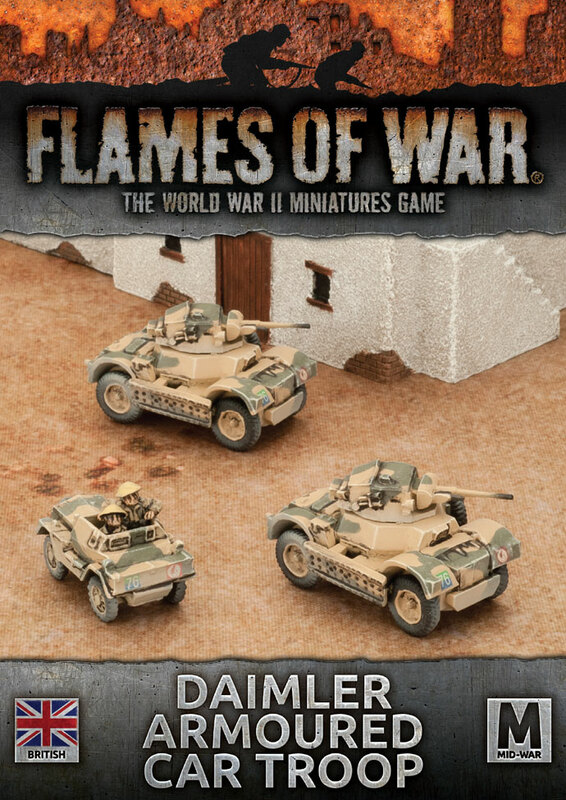 The Daimler armoured car was the latest model to be fielded by the British in the desert. Armed with the same 2 pdr anti-tank gun as the cruiser and infantry tanks, the Daimler was more than capable of dealing with enemy armoured cars. The Daimler armoured car was the latest model to be fielded by British in the desert. Armed with the same 2 pdr gun as the cruiser and infantry tanks, the Daimler was more than capable of dealing with enemy armoured cars. The little Dingo scout cars that operate with them led the advance, poking their noses into potential trouble spots and ambushes, covered by the guns of the bigger armoured cars concealed and waiting behind. The Humber is one of the most successful British armoured car designs. While its real job is reconnaissance, its 15mm Besa machine-gun poses a serious danger to lightly armoured targets. 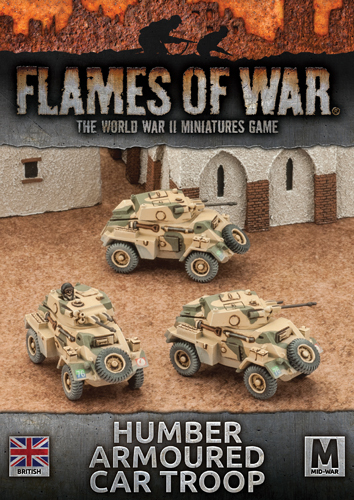 The Humber is fielded in North Africa by several cavalry units, including the 11th Hussars, one of the units that cut off the retreating Italian Tenth Army at Beda Fomm back in 1940. The open desert offers precious little cover from the Stuka dive-bombers of the Luftwaffe. The quick-firing Bofors guns can be relied on to drive away the harassing Axis aircraft before they have a chance to do too much harm. 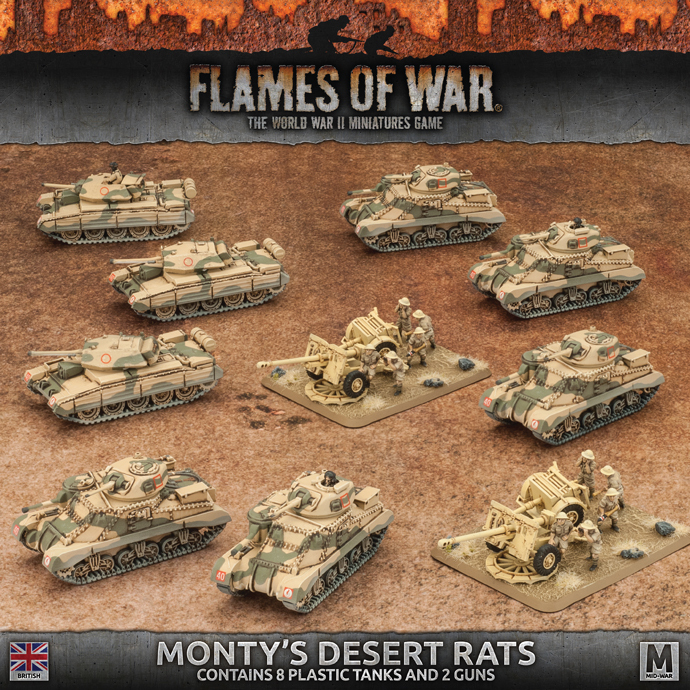 Painting your Flames Of War miniatures for 4th Edition couldn’t be easier with new Colours of War Desert Rats Paint Set. 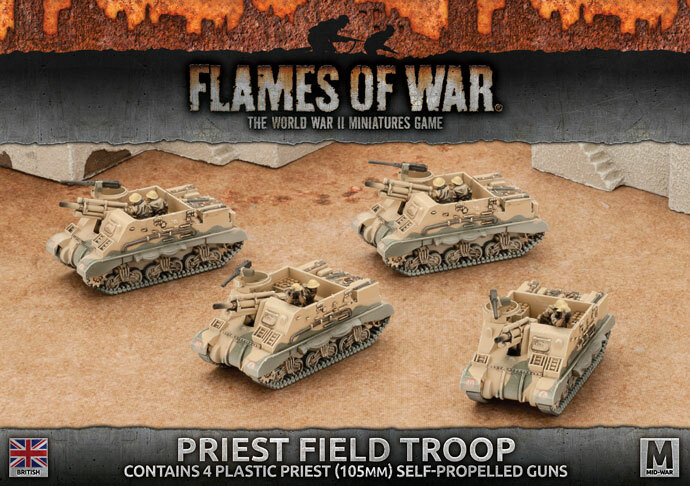 Used in conjunction with the Quartermaster Paint Set, it has everything you need to get your Mid-war desert vehicles ready for the tabletop. 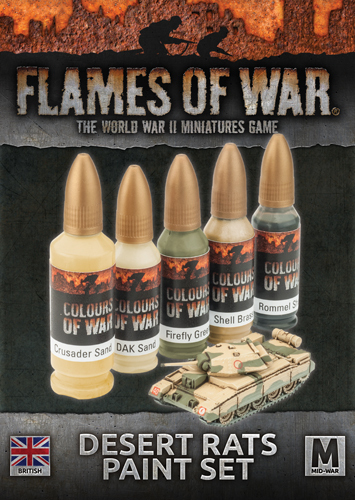 And to get your new British vehicles painted quickly and easily, Crusader Sand is also available as a 400ml spray can which exactly matches the bottled colour in the Desert Rats British Paint Set. This product is only available in North America, the UK, and Europe. 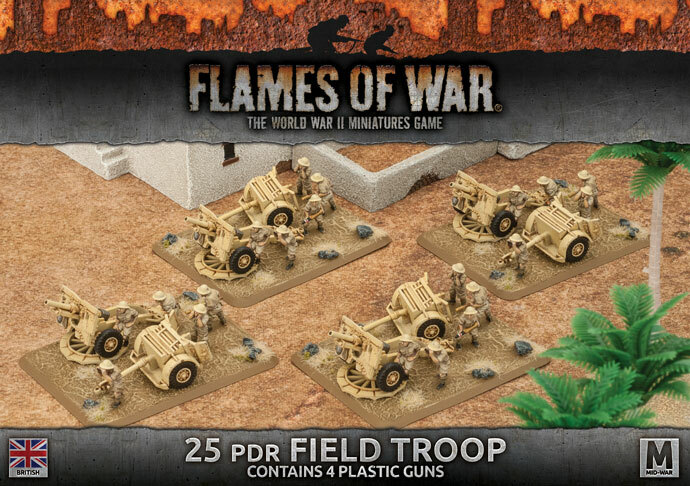 Even though they are toy soldiers, your troops react to heavy fire like real soldiers. Sometimes they get pinned down or bail out of their tanks. They can dig foxholes for protection or go to ground, hiding from the enemy. 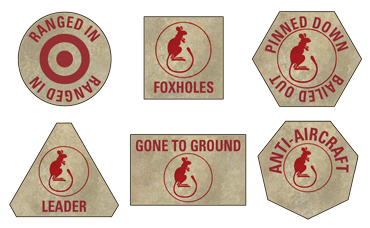 Tokens help you keep track of the state of your troops. The British Army has the Italian-German armies in Africa caught in a vice, and are steadily screwing the jaws shut. 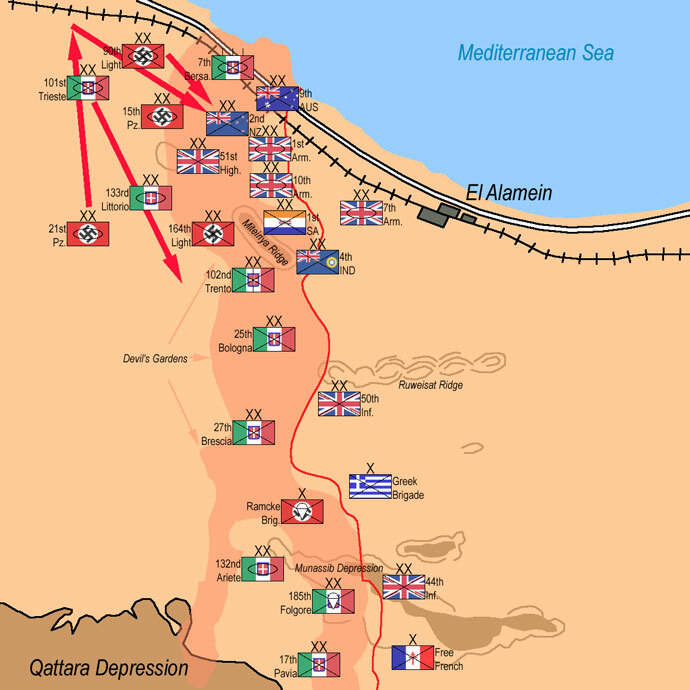 The Eighth Army is advancing from El Alamein in the east, while the First Army fights its way through Tunisia from the west. Together, they make up a force that can defeat anything the enemy brings against them, a force that will destroy the Axis forces in Africa. If He Hollers, Let'em Go! 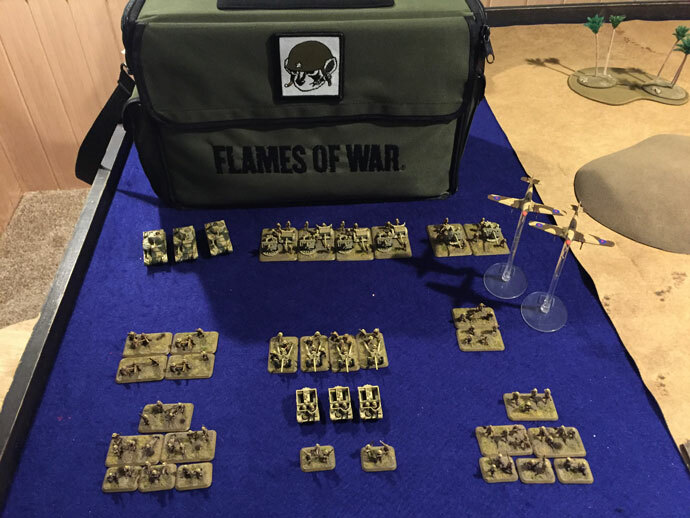 Rick and a friend of his, both regulars of the Battle Badgers decided to play a Mid War game. 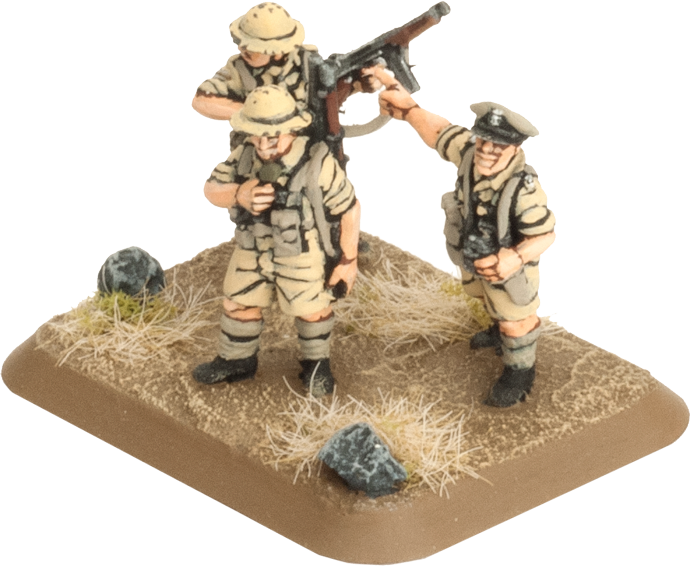 They took pictures of their 95 point game involving some beautifully painted models with the British going up againest the Afrika Korps. Check out how their battle went in the link below. After the fall of Greece to the Axis powers in April–May 1941, elements of the Greek Armed Forces managed to escape to the British-controlled Middle East. There they were placed under the Greek government in exile and continued the fight alongside the Allies until the liberation of Greece in October 1944. These are known in Greek history as the Greek Armed Forces in the Middle East. 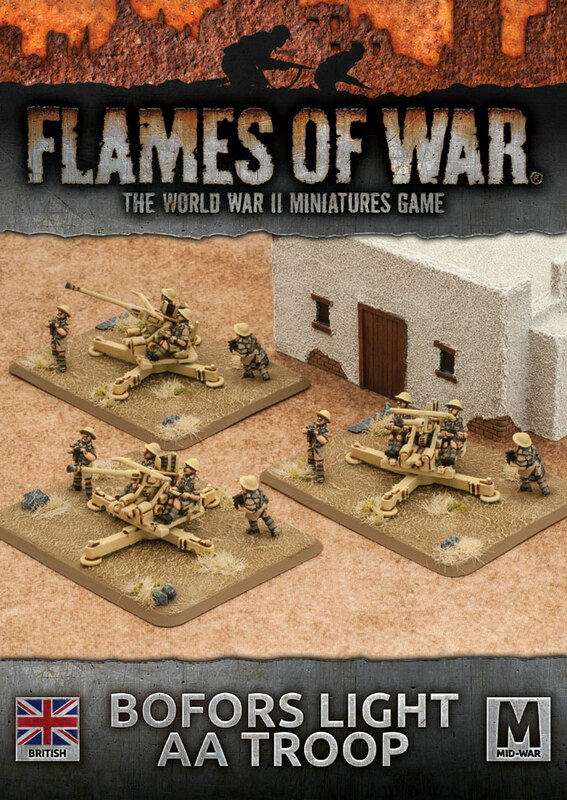 Mark looks at how to go about representing the Greeks in Flames Of War. 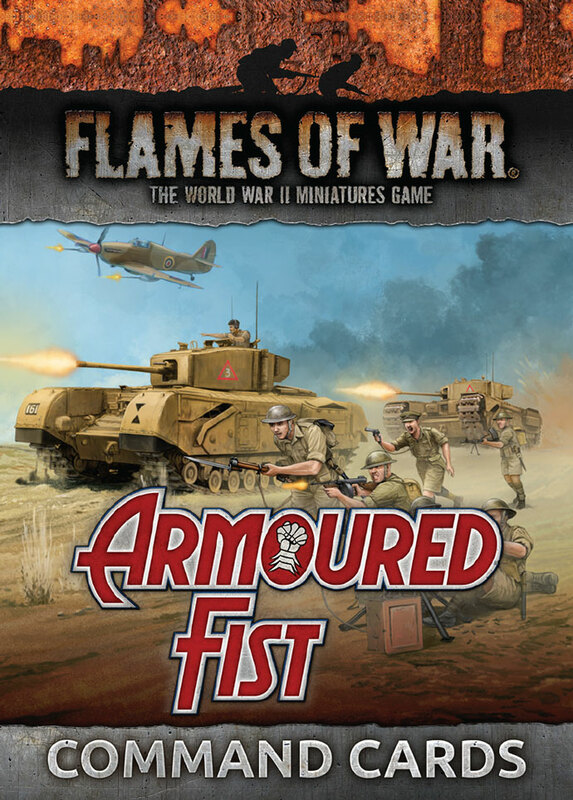 The release of Armoured Fist has given players a wealth of options to field in their British Army, from the mighty Churchill lumbering across the battlefield to the trusty Priest sitting back and lobbing shells. We've had a number of requests and suggestions from players about how to field the Bishop so we thought we would turn it into an Unofficial Unit Card. 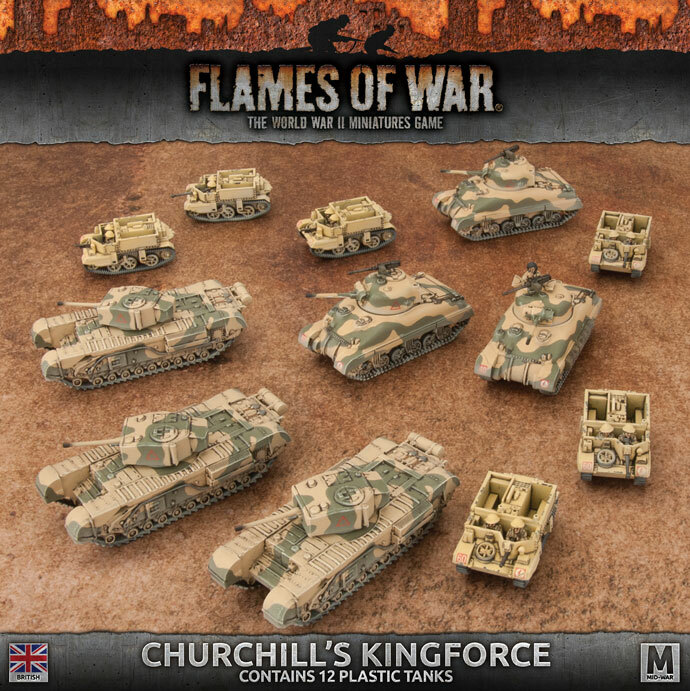 During the Armoured Fist Live Launch Chris wrote a short article about the Churchill Armoured Squadron he was very tempted to build. Despite having way too many half-started, half-finished and almost complete armies Chris has finally caved in to the pressure and started thinking about how to build them while also giving a touch of individuality. 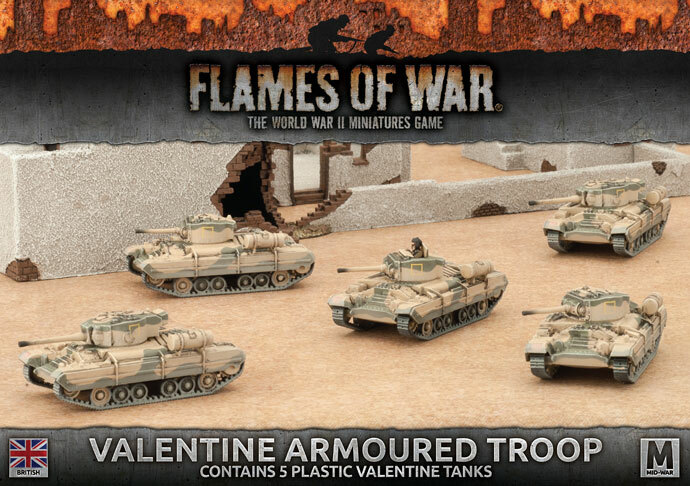 With the release of Armoured Fist, Ryan has been drawn to building an army of Valentines, not just because they’re getting new plastic models but also due to the fact that they look awesome. In this article he explores how he will go about building an army of Valentines as well as what tactics he plans to use with this force. The early North African battles were a constantly evolving challenge for nations who were learning the true merits and flaws of their tactics and technology, which had been brought to the boil again since the last Great War. 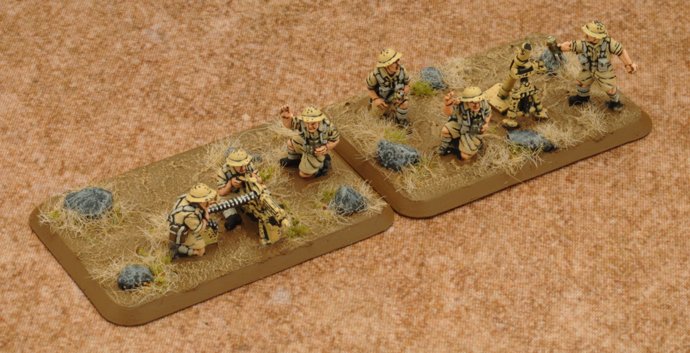 Harsh lessons were dealt and received to Axis and Allied troops alike under the unforgiving Saharan sun. 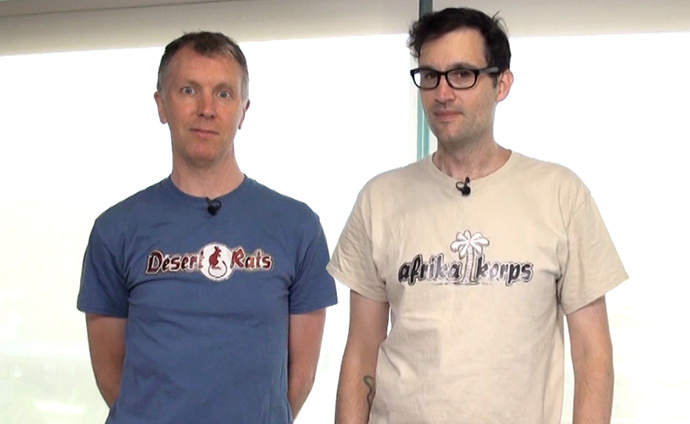 It probably comes as no surprise that over the past year or so we have been playing a lot of games with a North African feel as we release Afrika Korps through Armoured Fist. Building a good battlefield is key to ensuring that players have a fun game, with a variety of tactical challenges. 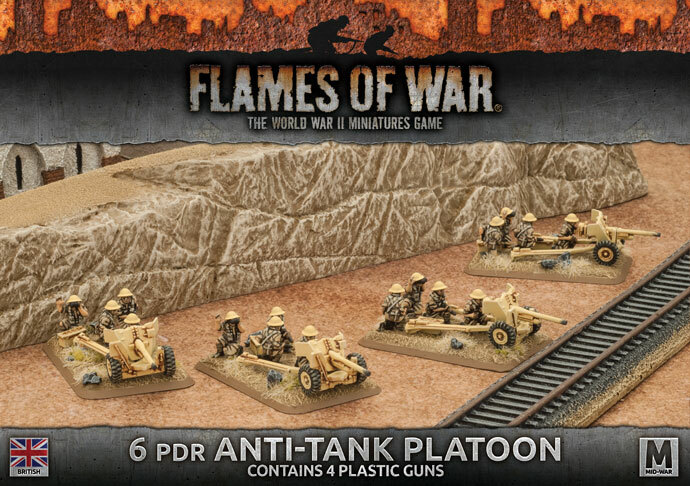 Thanks to the Battlefield in a Box range of pre-painted terrain I've got plenty of options to choose from as well. So what could a North African battlefield look like? With Flames Of War returning to the deserts of North Africa and the accompanying release of a wide range of Battlefield In A Box desert terrain sets, I thought it was time to build a battlefield of my own.My favourite part of the fighting in North Africa has always been the battle for the Sahara, waged between the remote outposts in southern Libya a thousand miles south of the famous battlefields. 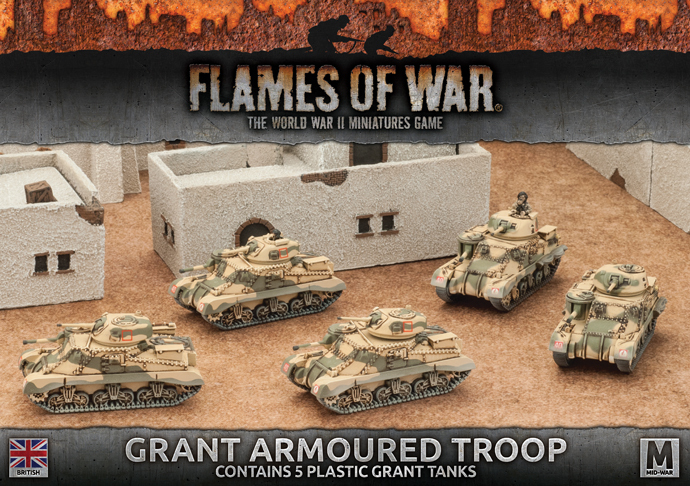 The British Eighth Army has a plethora of armoured options in Armoured Fist, which may confuse somebody new to Flames Of War who is trying for the first time to create a balanced force on the tabletop. 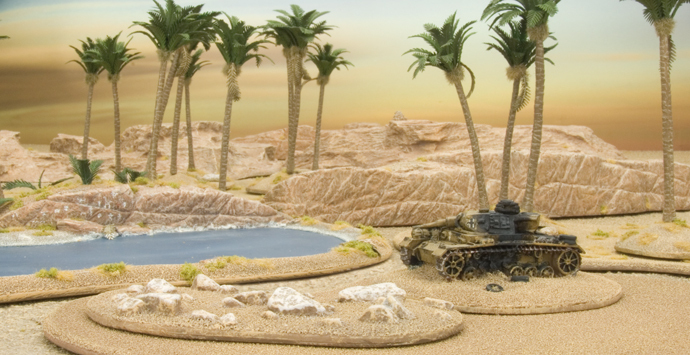 Each of the British desert tanks can play a specific a role in attaining your objectives on the battlefield, Ben examines each one in more detail. 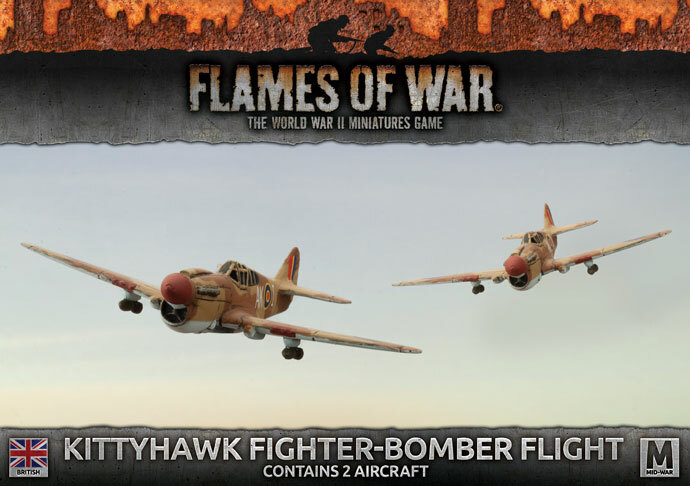 Jonathan has wanted to get into Flames Of War for many years, having a long held yet never fully explored interest in World War Two history. Thankfully, starting to work for Battlefront last year gave him an opportunity to look up close at the rules, the armies and the many different models before committing fully to an army. 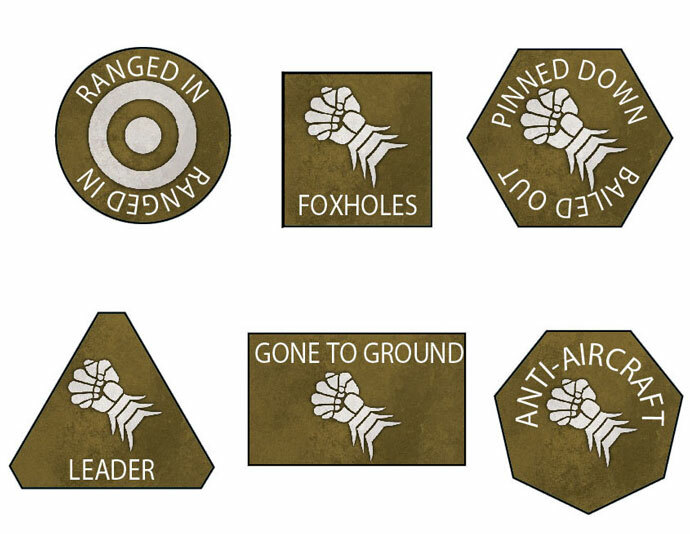 Desert Rats is no longer available.The new Force diagrams in Armoured Fist allow players to field new Formations as well as all the older formations from Desert Rats. 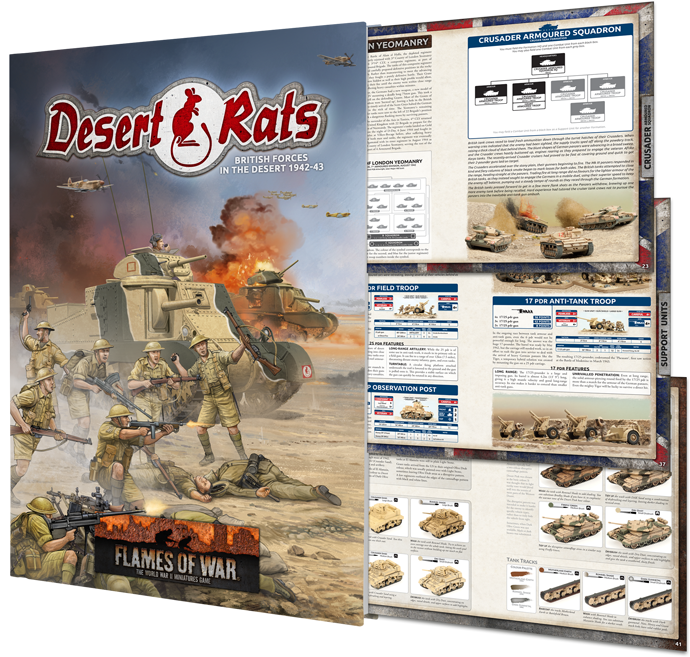 Rather than forcing players to dig through two books when building the army we decided to add the lists found in Desert Rats to Armoured Fist so players would have a complete set in one place. 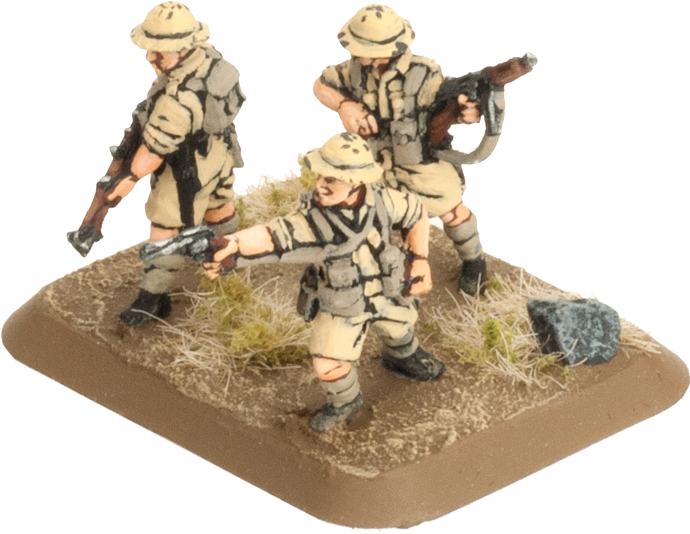 Including these older lists in the book was a simple decision for us as it makes life easier for our players, but we also recognise that people have bought Desert Rats and have been using it for the past year. 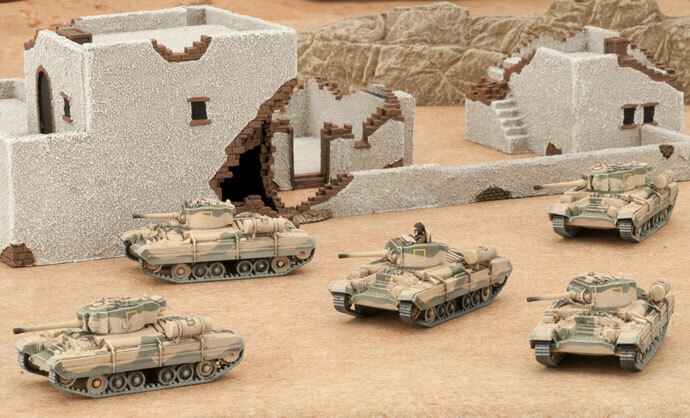 To thank our veterans of the desert when you purchase Armoured Fist just show the retailer your copy of Desert Rats, get our “Churchill Tanks Deployed” sticker added to the inside cover and receive a free Churchill Tank sprue. 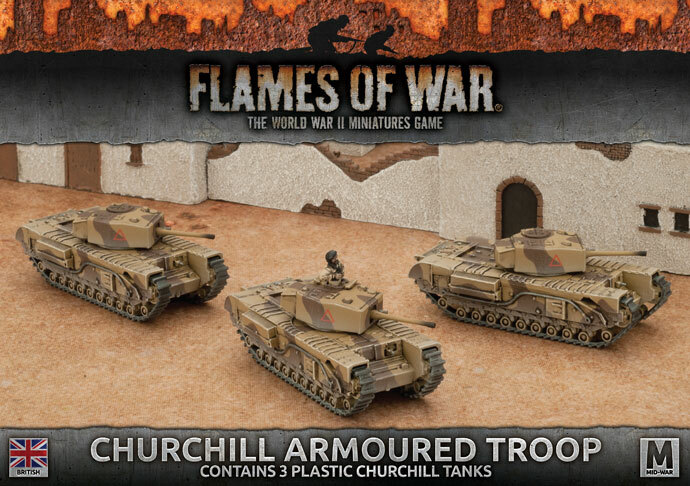 You now have your first Churchill tank so you can start building your North Irish Horse Churchill Armoured Squadron (or just a platoon). 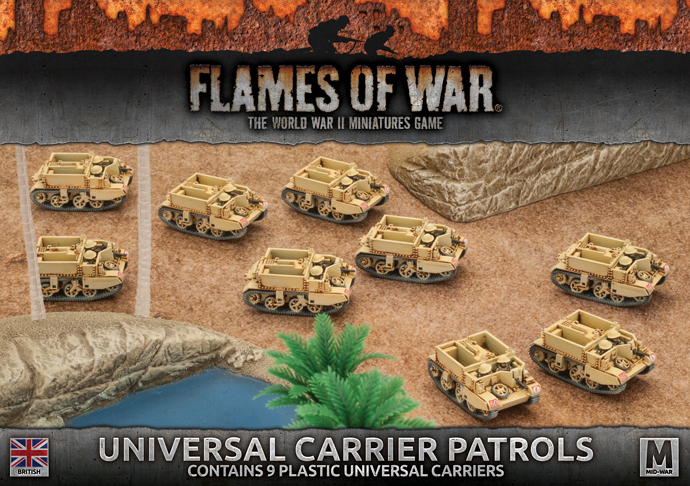 For Flames Of War Digital users too. 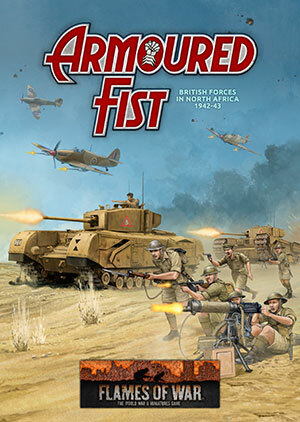 If you bought originally bought Desert Rats and now pick up Armoured Fist inside the app, just email our Customer Service team with a copy of the iTunes or Google Play receipts (for both books) along with your address details and we will post out your frame to you for free! 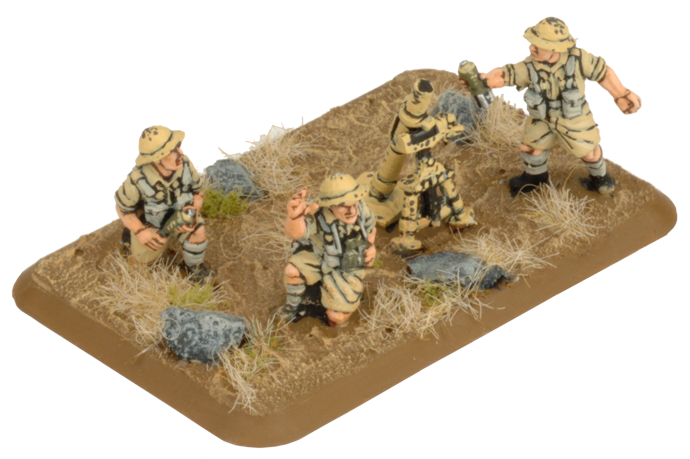 The Desert Rats are the only thing standing in the way of Axis conquest of North Africa. Despite suffering repeated defeats at the hands of Rommel’s Afrika Korps, they remain undaunted. 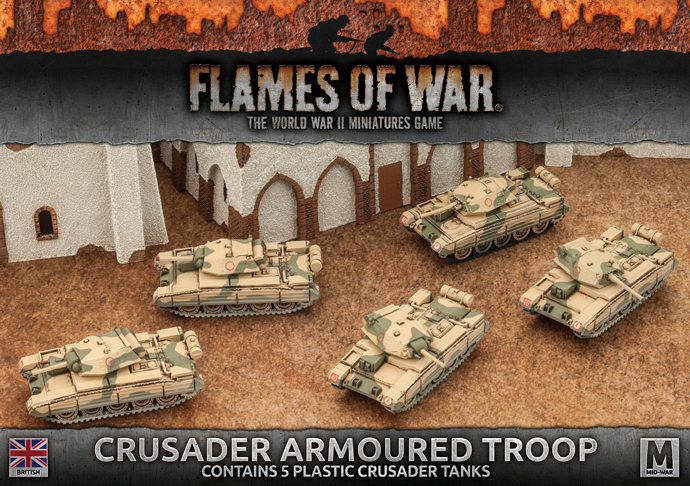 Their speedy Crusader and Honey tanks can run circles around their opposition, backed up by the heavier Grant squadrons. Their motorised infantry are equally adept in attack or defence. With support from the Royal Artillery and the Desert Air Force, they are a formidable and versatile force. 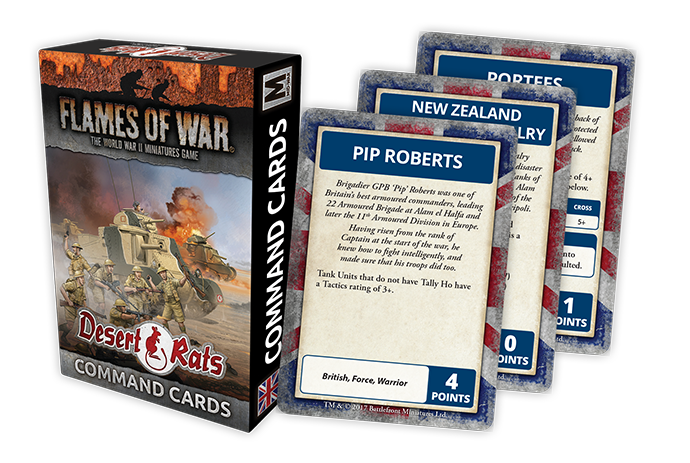 Command Cards provide Flames Of War generals with a way to further personalise and enhance their forces.